new! Zoisite and Kunzite: Before you look at this picture and get weirded out, you should know that this is a preliminary sketch for a project I started after studying artist/character designer Amano Yoshitaka (whose work, incidentally, I used to detest!). The Shitennou. This is the famous group pic from ep. 44 (the one where they're not dying!). Done in pen and ink with a lot of different techniques, this picture scanned pretty badly (grr...), but it's still mildly okay. Kunzite and Zoisite. Um... in marker. I don't use markers very well, but I kind of like the way this one turned out. As usual, Zoisite turned out better than Kunzite did. Kunzite's a bit too brown here... you shouldn't leave me alone with dark markers, really. Zoisite. On my previous fanart section I had a picture of him in this same pose, but I daresay that this is a vast improvement over the old one -- though certainly not perfected (yet!). In watercolor. Kunzite, with his back to us, eyes closed. Modeled somewhat after a doujinshi, I suppose. In pencil. Zoisite. In colored pencil. I was trying to get an impressionistic look, I suppose, but the color variations didn't show up as well scanned. :( Maybe I'll try later. But isn't he such a cute gymnast? Zoisite and Kunzite. Standing. In pen and ink. Looking bored. I don't know why. 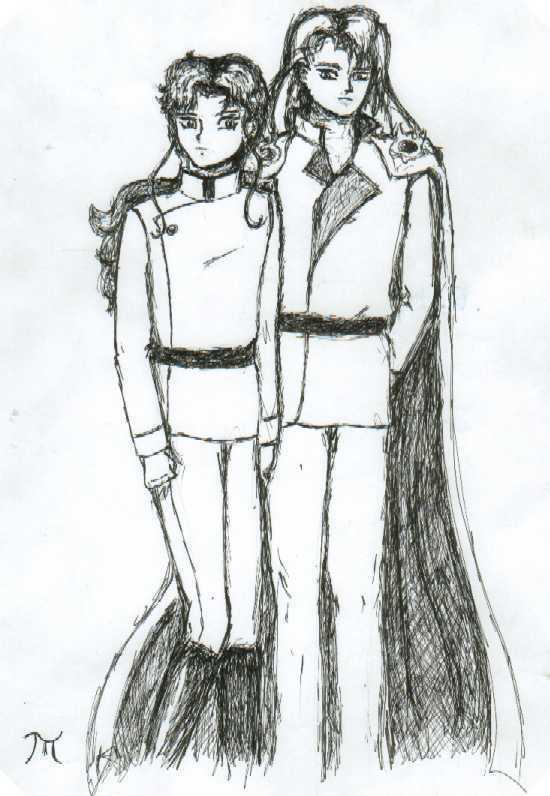 I also don't like Kunzite's face here, but, being that I had no model and I was still learning the medium, I'm not too angry about that. 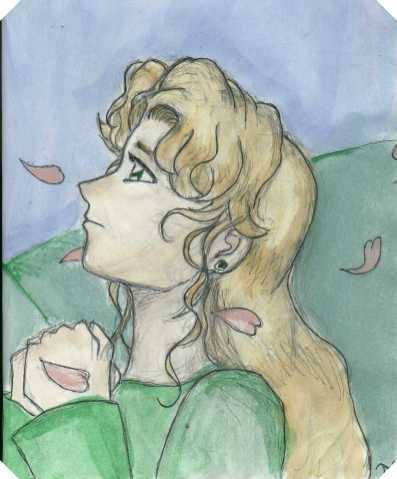 Nephrite's Symbol. My glass-etching project in art. I'm so Shitennou-obsessed that I'm ashamed of myself sometimes. Jadeite. A rare doodle (I was supposed to be taking notes...) of his profile. It's been greatly enlarged and sharpened to be visible. Eternal Sailormoon. This was my final in the pen-and-ink medium for art class, modeled after a Takeuchi Naoko artbook watercolor. As such, it probably is the best done picture here (it's stippled! ), despite that I greatly reduced its size to fit the screen. Bishoujo Senshi Sailorvenus. Modeled after a manga picture, done while I was practicing the pen-and-ink method. 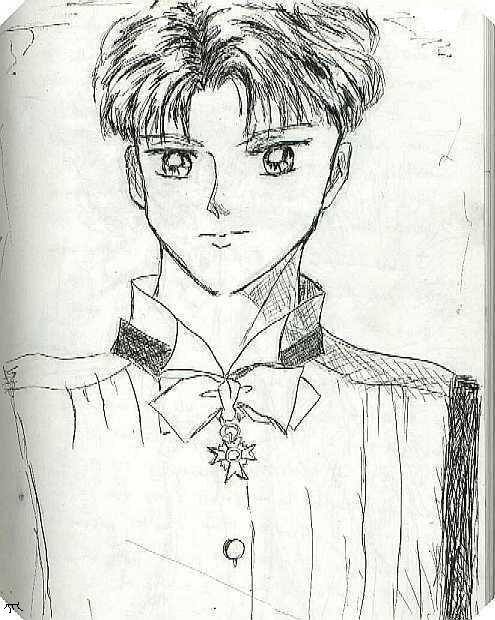 Tuxedo Kamen: Same story as above. I don't like his neck -- but hey, practice is supposed to be a learning experience. Sailorstarmaker. This was a picture that was part of my original fanart collection from way-back-when. I stumbled across her under my bed, and since she is one of my favorite senshi and I didn't hate the old picture too much, I decided to paint her. Sephiroth. The reason the title of this section no longer says "Any Other Sailormoon Characters". Modeled after a statuette, drawn in pencil. Any comments are very, very appreciated. I've only been studying art for a year, and my self-confidence needs all the building it can get. Thank you!